Mercedes-Benz already has seven SUVs in the program, but it looks like it has one more ready to press itself. Well, more like building muscle. 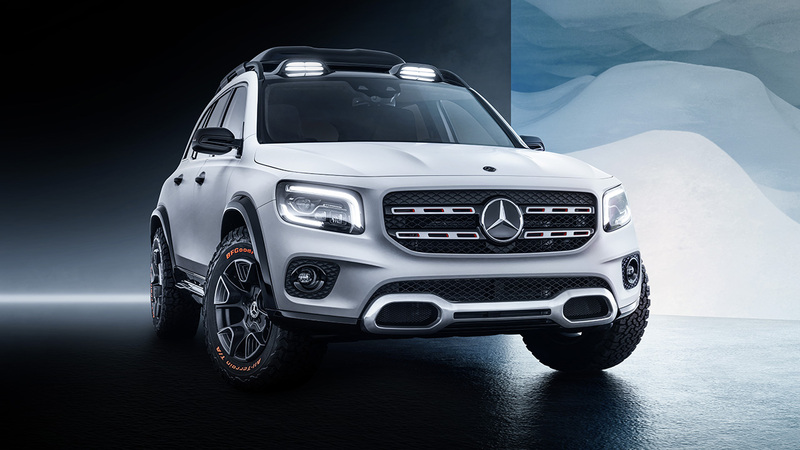 The Concept GLB debuts at the Shanghai Auto Show is a sneak preview of a likely future compact crossover program with rugged features and some off-road capability. The seven-passenger vehicle is a size between GLA and GLC and is boxier and bulkier than the two. From the black fender flares to the pronounced rocker panels and the elevated right-hand height, an alternative future seems to have come, in which Daimler-Chrysler never broke up and Jeep merged with Mercedes-Benz instead. The formula is similar to that used by Ford to design a Bronco-inspired commercial vehicle based on the Escape. The all-wheel GLB is conceptually equipped with a 2.04-liter turbocharged engine with 224 hp. Cylinder, 8-speed dual-clutch automatic transmission and an all-wheel drive system that can be locked to split 50:50 power between the front and rear wheels for easy off-road performance. Rails, headlights and a storage box on the roof underline his expedition intentions. In the spirit of the G-Class, the interior of the GLB is covered in leather, suede and real wood trimmings and has a short dashboard with round vents and dual 12.3-inch displays like its big sister. Despite the limited overall length of the GLB, Mercedes-Benz says the third row is suitable for "medium-sized" adults and the second row slides forwards and backwards to accommodate space usage. Mercedes-Benz has not confirmed its plans to put it into production, but pointed out that the original GLA concept was presented at the same show in 2013 and was in showrooms the following year.